Can’t be bothered cooking? I hear you. Let my 5 Minute No-Chop Salad Recipe come to the rescue. 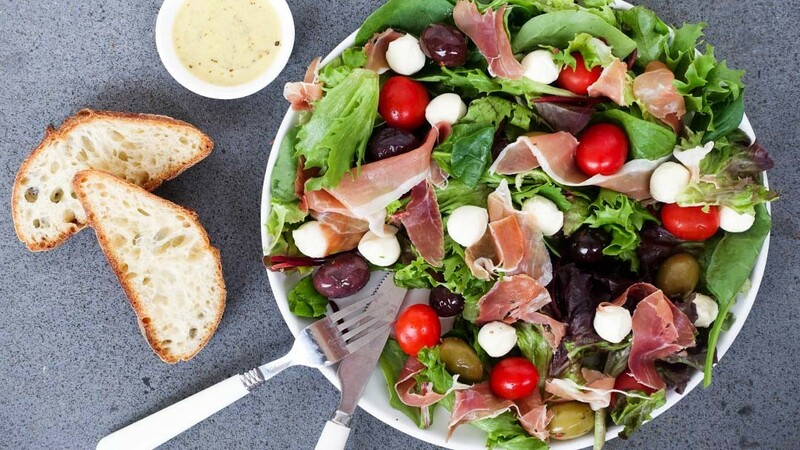 Throw all the yummy ingredients into a bowl, I’m talking prosciutto, olives and cheese (you can never have too much cheese!) And wah-lah! Dinner is served without picking up a knife. Completely, AMAZING isn’t it? Try this super easy summer salad today! This 5 Minute No-Chop Salad is the ultimate dinner when you don’t feel like cooking. 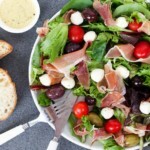 Full of yum stuff, like prosciutto, bocconcini and fresh crunchy salad, it takes easy to another level. Divide the mixed leaves, tomatoes, olives and cheese into two bowls. 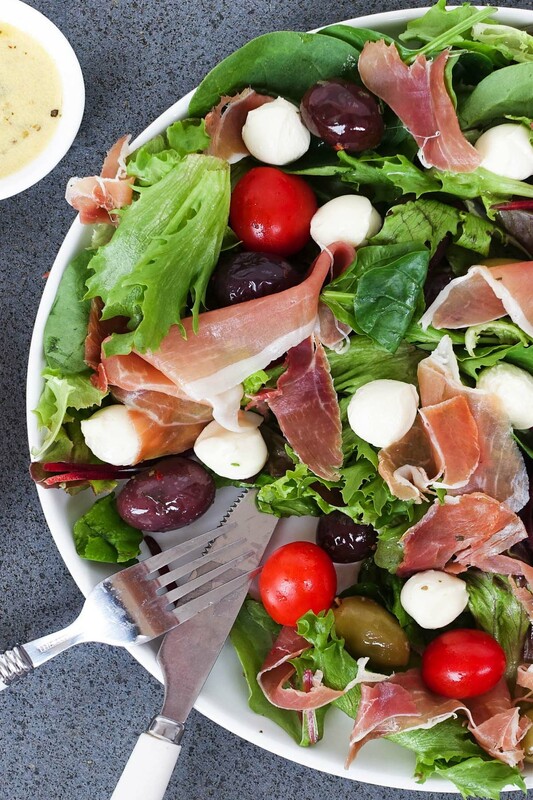 Tear the prosciutto into pieces and scatter it over the top of the ingredients in each bowl. Put the dressing ingredients into a jar and season with salt and pepper. Place the lid on the jar, and shake until all the ingredients are well combined. Pour the dressing over the salad. Serve each bowl of salad with a slice of bread (or two). Forgot you said you’d bring the salad? Just double the ingredients and you’ve got yourself a delicious healthy summer BBQ salad that everyone will love. Get creative, and add your own favourite no-chop ingredients. There’s heaps to choose from at the deli, think grilled eggplant, capsicum or zucchini – yum! If you make my No-Chop Salad remember to share it with me on Instagram. I love seeing and sharing your creations. Plus, one lucky reader each month will win their own You Totally Got This grocery bag. You can find me @youtotallygotthis – don’t forget to set your account to public and use the hashtag #youtotallygotthis so I can find you. P.S – Want a whole weeks worth of dinners just like this No-Chop Salad? Grab your FREE quick and easy weeknight dinner plan right here.